In the no holds barred battle for the Nadigar Sangam the degree of heat has touched volcanic proportions as Vishal released proof of misappropriations by the incumbent members and for his part Sarathkumar has filed a criminal defamation complaint against Vishal. Vishal has been maintaining a stoic stand as far as the Nadigar Sangam is concerned and has clearly stated that he will not back down irrespective of whoever requests him. Some miscreants have found a twisted meaning in Vishal’s stand with the intention of getting him into trouble with the state high command. 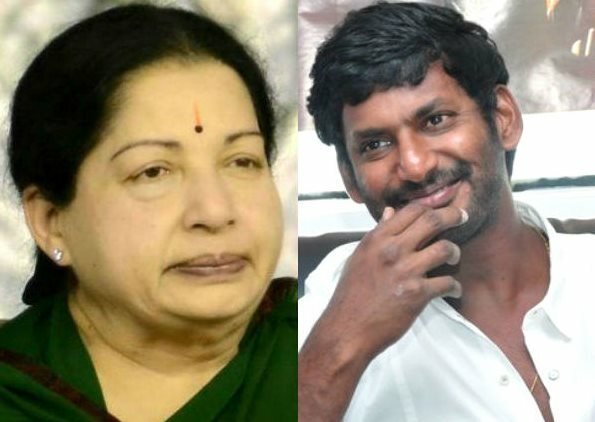 These trouble makers are spreading rumors that Vishal supposedly stated that even if the Chief Minister of Tamilnadu, Jayalalitha asks him he will not budge. Vishal has taken twitter to clarify about this rumor.